Tonoptik project was created in late 2014 in Saint Petersburg (Russia) as a result of collaboration between media artists Yury Tolstoguzov and Alexander Inkov. They experiment with sound and visual configurations, basing their approach on the principle of live improvisation. Such styles as ambient, drone, glitch, techno are intertwined in their music, while the overall sound concept is in a minimalist aesthetic. 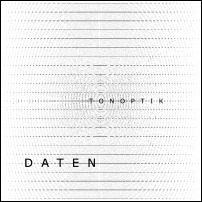 The release called Daten consists of improvisational sets united by the idea of contrast. The first track Attentat, based on a strict rhythmical pattern connected with a wild analogue sound's expression. The Treiber set goes with an electric static sound accompanied with synthesizer's spontaneous modulated buzzing. The Breil track composes an organic-like pulsation with a rich but almost monotonous hum. Alexandr Inkov plays Moog Minimoog Voyager and Elektron Octatrack; Yury Tolstoguzov plays DSI Prophet 08 and Elektron Octatrack.